Once you have been setup on a 250ok child account you will need to take a few minutes to setup your seed list and configure your 250ok settings. NOTE: If you need to get setup with a 250ok child account, please sign up at Managing Email Delivery with 250ok. Export your entire mailing list from ONTRAPORT. Login to 250ok using the credentials provided to you by ONTRAPORT (read and agree to their terms if this is your first login). When you are satisfied with the weighting and regions in your seed list scroll to the bottom of the page and click save seed list. Once this is done 250ok will automatically apply weights according to who is on your list. The seedlist generated by 250ok is a representative sample of your current Contacts database, making it easier and less expensive to test deliverability. Open the downloaded file and re-save it as a .csv file (the file you download will be in .txt format). Login to ONTRAPORT and follow our normal import process. Be sure that you include a unique Tag on these new contacts so they can be grouped and excluded from regular mailings. Most people use a tag such as "Seed List [today's date]" as the tag name (you can add a Tag to the import in step 5, Rules). After importing the seedlist you will be able to include it on any mailing, or mail it on it’s own to see how the content of your messages perform before you send them to your real contacts. Here are the steps to run a seed test once you have imported your seedlist. By sending ONLY to your seedlist, you can verify if the content of your email is going to trip many spam filters. 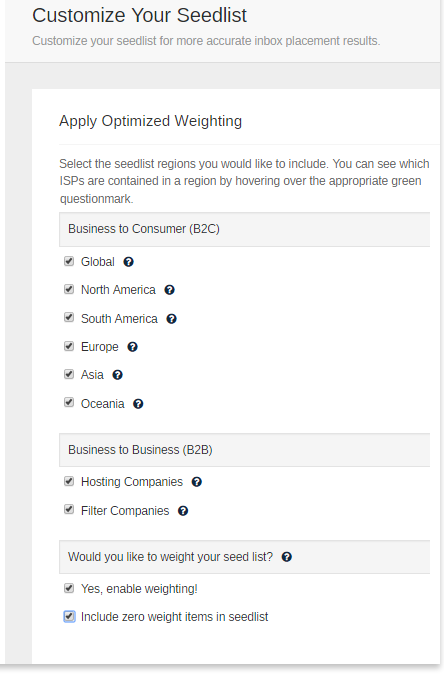 Here's how to test your content by emailing directly to your seedlist. Create a group based on the criteria Contact Tags>Contains >Seed List [date] where Seed List [date] is the tag applied in step number 5 under Importing Your Seedlist above. Send the email you would like to seed test to this group. Edit the Group that you are sending to and add the criteria Contact Tags>Contains >Seed List [date], where Seed List [date] is the tag applied in number 5 under Importing Your Seedlist above. This will create a sub-set of your Group with only seedlist contacts. Send your broadcast as normal. Be sure that you remove that criteria from your Group after sending to ensure you do not run a seed test each time you email that Group.